Investors pushed global steel giant ArcelorMittal higher than its peers last month. Here’s what was going on (hint: It was about more than steel). ArcelorMittal SA (NYSE:MT) shares advanced roughly 11.5% in October. That was a better performance than that of the steel mills that ArcelorMittal is normally compared to. However, there's more going on at this steel giant than at many of its steel peers, and that helps explain the better-than-average showing. ArcelorMittal research center. Image source: ArcelorMittal. 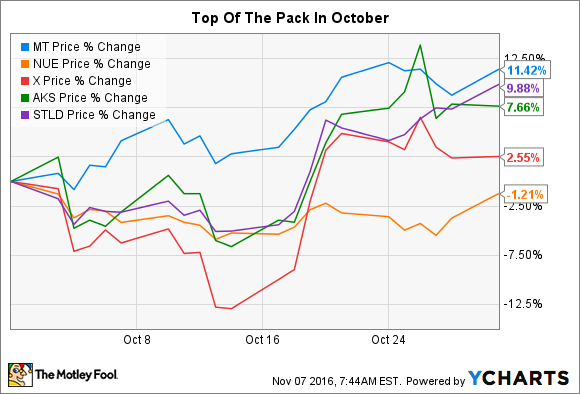 The major steel names, like ArcelorMittal, Nucor (NYSE:NUE) and United States Steel, had a mixed month in October, with gains ranging from ArcelorMittal's leading 11.5% advance all the way down to a monthly loss of about 1% at Nucor. There was good reason for the mixed showing. On the low end, Nucor posted solid quarterly earnings results, but offered up weak guidance for the fourth quarter. That displeased investors, as you might expect. The flip side was notably improved results at long-suffering AK Steel (NYSE:AKS), up 7.5% in October, that buoyed the mood of investors in that stock. Although an improving steel business was important, AK Steel also managed to pay down debt and maintain its liquidity in the third quarter, two major positives for a company light on cash and heavy on debt. ArcelorMittal didn't report earnings in October. So investors pushed it higher along with some of the other steel names likely expecting positive news in early November, when it was scheduled to report results. But there was a little more gusto at ArcelorMittal than you might expect from this spillover effect alone. Part of that is the fact that ArcelorMittal has been working hard, and successfully, to repair its own balance sheet. But there's something else you need to keep in mind here: ArcelorMittal is a mining giant in addition to being a steel giant, producing both iron ore and steelmaking coal. And that's where at least part of the extra push from investors likely came from. For example, Teck Resources Limited (NYSE:TECK), a supplier of metallurgical coal to the steel industry, noted in its third-quarter earnings release that the price of met coal pretty much doubled in the third quarter. Iron ore prices, meanwhile, have been heading generally higher since hitting a low point in mid-January. And while iron ore prices dipped a bit over the last couple of months, they have started heading higher again lately. That means ArcelorMittal's mining operations could provide a nice boost to results in the third quarter. Iron ore's long downtrend appears to be reversing. Image source: Vale. To be fair, mining, at about 5% of revenue in the second quarter, is a much smaller business for ArcelorMittal than steelmaking. But there are two benefits from the company's vertically integrated model that can make a big difference. First, it produces iron ore and met coal for its own use. When commodity prices spike, that can help to keep costs in check -- a competitive advantage over steelmakers that have to buy more of these inputs on the open market. Second, ArcelorMittal also sells some of its met and iron ore to others. When prices spike, it can make more money in that business. Neither of these commodities is going to make or break ArcelorMittal, but they do help it to stand out from many of its steelmaking peers. During the commodity downturn, being a miner in addition to a steelmaker was a net negative. But that appears to be changing this year. And with improving results in mining added to the expectation of better results in the steel business, you can understand why investors gave ArcelorMittal a little edge over its more steel-focused competitors. If you're looking for a steelmaker that spans the world and controls some of its own destiny via mining operations, ArcelorMittal is worth a deep dive.